The terms Alzheimer’s and dementia are often used synonymously, but they aren’t the same. 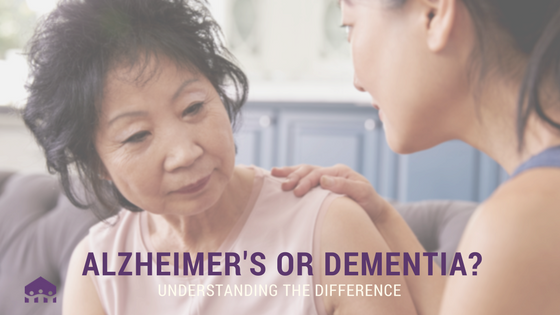 Knowing the difference between the two can help you better understand your loved one’s diagnosis and how to provide the best care. Dementia is a broad term used to describe various symptoms that can impact cognitive functions such as memory and reasoning, one’s ability to perform daily activities and communication. Dementia is considered a syndrome, but is not a disease itself, and can occur due to a number of degenerative conditions, including Parkinson’s, Huntington’s and, most commonly, Alzheimer’s disease. According to the World Health Organization, about 47.5 million people around the world are living with dementia. Symptoms of dementia are often mild at first, often beginning with episodes of forgetfulness, difficulty keeping track of time and becoming disoriented or lost in familiar settings. As dementia progresses, symptoms worsen and forgetfulness and confusion become more obvious. Other signs of dementia can include repeatedly asking the same questions, poor hygiene and poor decision making. People may have more than one type of dementia, a state known as mixed dementia. In these cases, people with mixed dementia have multiple conditions that contribute to dementia. This diagnosis can only be confirmed in an autopsy. With the progression of dementia, one’s ability to function independently lessens and the individual living with dementia becomes unable to care for him or herself. Behaviors may even turn into depression and aggression. Dementia is a major cause of disability in aging adults and can be both emotionally and financially burdensome for families and caregivers. Although dementia most often occurs in senior adults, it is not considered a normal part of aging. In some cases, young people may also develop dementia due to infections such as HIV, vascular disease, stroke, depression or chronic drug use. Alzheimer’s is the most common cause of dementia and accounts for 60 to 80 percent of dementia cases. It is a progressive disease of the brain that causes problems with memory, thinking and behavior. Though symptoms are often mild at the onset of the disease, as they worsen over time, Alzheimer’s often interferes with daily tasks. In the late stages of the disease, Alzheimer’s can limit one’s ability to carry on a conversation and respond to their environment. Alzheimer’s is the sixth leading cause of death in America and there is no current cure for the disease. Treatments for Alzheimer’s cannot stop the disease from progressing, though they can slow the progression of symptoms, improving overall quality of life for the person living with Alzheimer’s. If you or a loved one has been diagnosed with dementia or Alzheimer’s, you are not alone. The Cottages provides licensed and certified state-of-the-art assisted living residences for those living with Alzheimer’s disease and other memory disorders. We also understand how difficult it can be to watch your loved one suffer from memory loss and dementia. We provide support groups for family members, ongoing caregiver support and grief counseling. Contact us today to learn more.